In his book, Chopra mentioned that we can experience both happiness and sadness with the same welcome, because neither are real. This really hit home later while I was cooking dinner a wave of fruitlessness passed over me. As I focused on this emotion, I remembered that it wasn’t really ‘me’ and away it went. It was the first time I practiced non-attachment of my emotions and realized how freeing it could be. So if I am not my personality, my body or my thoughts, who am I? While I believe that I am an eternal, perfect being—a lifetime of a changing body, events, and thoughts have made it nearly impossible to totally comprehend this belief. I have tried to “find” my true self by meditating daily, losing myself to the love that flows through me. I know that this perception is much closer to the real me than my normal reality, but it’s still a limited experience, because it uses my senses. Chopra wrote, “Vedanta holds that consciousness is convinced by its own creations. Therefore, nothing we can see, hear, and touch, whether in waking, dreaming, or beyond both, is ultimately real. They represent shifting perspectives.” It is the illusion convincing itself of its own reality! If this life is an illusion, then where do we really reside? We often think of our true selves going “somewhere” after we die, such as heaven or hell. I had an experienced in October 2010, a few days after my mother passed, which helped me to see that we don’t go anywhere—it is only our perception that changes. The event took place at my mother’s workplace. I was in a meeting with my sister and the HR director who was going over our mother’s life insurance benefits, which had been split evenly between us. Then the HR director mentioned that my mother’s pension had been given solely to my sister. I immediately felt resentment, but I didn’t want to feel this way toward my sister, especially while I was grieving for my mother. So I asked the Spirit to take this painful emotion from me. It was then that I experienced my greatest miracle. Here are the details taken from my book, Shaman Stone Soup: “After the meeting, we were taken to my mother’s cubicle to clean it out. I was emotionally distant from my sister as we emptied the drawers. I kept battling against the resentment that picked at me, and I asked the Spirit to take this thought from me. Suddenly, my mother’s spirit descended over me. Her presence completely surrounded me and her vision became mine. Through my mother’s eyes, the whole world glowed with love and beams of light radiated from my sister. My mother’s memories filled my consciousness, and I could see my sister as the little girl, teenager and young woman she had raised. My mother saw her as an innocent daughter, who would be taken care of with the pension she had inherited. I felt the comfort that it gave my mother and the love she had for my sister. Immediately, all resentment left me. I knew my mother had given the pension out of love, and as I experienced that love, it became impossible for me to feel anything else. Although I had never left the room, the dreary office space had transformed into golden light. My sister, the room and even the world, became faint outlines and love became the predominant vision. It made me realize that we don’t go someplace else to find ourselves. Love is all around us. Death was not the end of my mother. She was able to communicate with me and send her love. The miracle had helped to show that we are all connected, whether we have a body or not. Perhaps recognizing our true selves is taken in baby steps. Starting with a willingness to find it and asking for help from a higher source who sees beyond our illusion. We then begin receiving visions and experiences of pure love, which help us to develop a more “real” perception within this illusion, a step that allows us to ready ourselves for the final step into all-encompassing love. 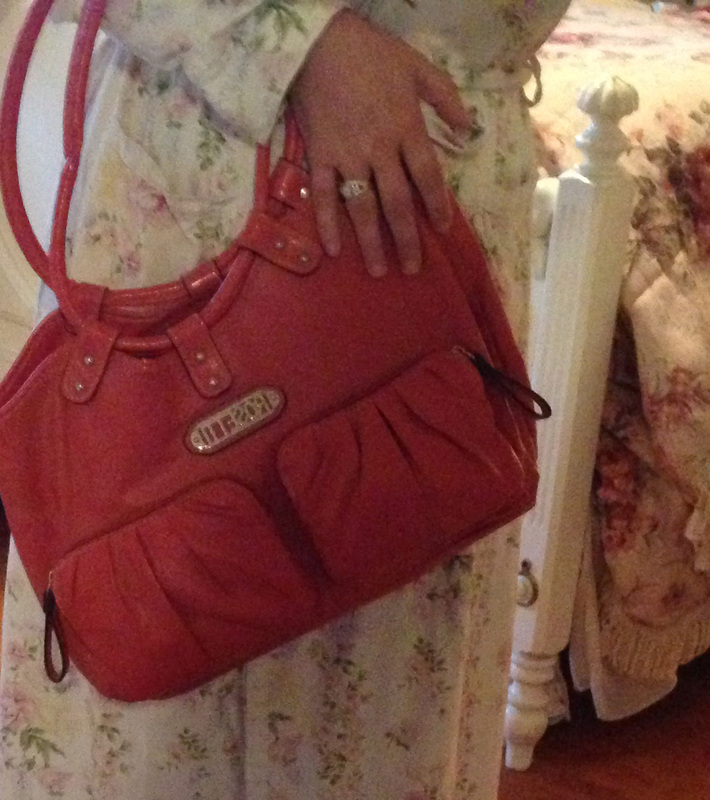 There is a purse that sits in a makeshift shrine in my bedroom that used to belong to my mother. Its contents are sentimental. There is a travel-size container of hand lotion she religiously applied, and several tubes of lipstick, pale pink and peach. She also kept an address list tucked inside, handy for her unexpected visits to friends and family. On the tattered sheets were handwritten edits — phone numbers, emails and addresses. A log roll of the people she loved. Throughout my life, my mother talked to me about her numerous friends, distant relatives and co-workers. Irritated, I would interrupt her. “Mom! I don’t know who you’re talking about!” I knew even then, I’d regret those words. Wasn’t I the one who reminded her to be kind to her own mother? Telling her that grandma would be gone one day. Yet she is still alive. It’s my mother who is gone. It’s been over three years since her passing and I still have her purse. The purse I couldn’t let go of after her sudden death. I carried it from her home to my car, to the funeral home, and while shopping for the clothes she would be buried in — ultimately taking it home with me. Today, I remember my mother with love. That strange, intertwining emotion that she and I shared as we pushed each other’s emotional buttons, fought and made up. How I wish I could send her flowers today, on her birthday, then she would call me to say, “Thank you! They’re beautiful!” and immediately begin telling me stories about people I don’t know. We often underestimate the importance of meaningful communication. But the need to share ourselves with someone who looks at us with loving eyes and a non-judgemental heart is essential to our well-being. How many of you have had a heart-to-heart conversation lately? One that inspired you, made you feel loved, or showed you the need to make amends? Our western society often leaves us feeling isolated. We are results-oriented, and a conversation that doesn’t profit us is often considered a waste of time. But as the Beatles’ song says… “Money can’t buy you love…,” although it can buy you companionship. Without the exchange of meaningful communication, we are just bodies in the company of other bodies. We have a great need to share our spirit with another spirit, and connect beyond the physical to experience love. Be in the moment. You can only connect with the spirit being in the present. Remember ‘yesterday’ is memory and ‘tomorrow’ is only a concept. Feel what the person is saying, instead of analysing it. Share the conversation – each person should feel heard. When one person dominates the conversation, it makes the other feel unappreciated and therefore ‘unseen.’ So, ask questions, listen and give of yourself. Words are optional. We can share love through our actions… sometimes a hug can say it all! There are days when friends or family aren’t available or are dealing with their own issues, so instead I turn to Shamanic journeying or meditation to connect to the Spirit and feel the love that I need. It also allows me to express my feelings to a non-judgmental being who responds with perfect love.